One of the engines on the crashed TransAsia flight stopped 37 seconds after take-off and the pilots could have switched off the remaining one in an attempt to restart both, according to Taiwan's top aviation safety official. Preliminary investigation findings, based on black box data, were presented at a news conference in Taipei by Aviation Safety Council Executive Director Thomas Wang. "The first engine experienced a problem 37 seconds after take-off at 1,200 feet [366 meters]," Wang said, as cited by Reuters. "The flight crew stepped on the accelerator of engine 2 [righthand side]... The engine was still operating, but neither engine produced power." 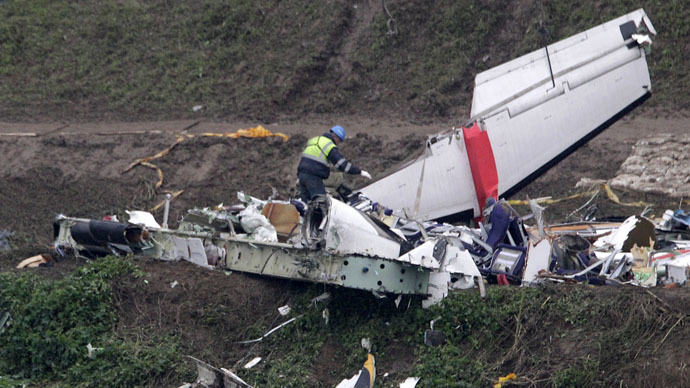 The flight recorders indicate the plane warned five times of stalling before it crashed. The right engine appears to have failed to produce enough thrust, Wang said. The flight crew then chose to shut down the left engine. They then tried to restart both, but did not succeed. A more detailed report on the crash will be available in the next 30 days, while a final report is expected in three to six months, according to Reuters. Thirty-five people died after TransAsia plane crash landed into a river in northern Taiwan, February 4. Fifteen survivors are in hospital and eight passengers remain missing, according to Taiwan's Civil Aeronautics Administration (CAA). Earlier reports stated that the pilot of the TransAsia plane, hailed as a hero for his actions in the last moments before the crash, was still holding the joystick in the plane's cockpit when his body was found. Liao Chien-tsung, 42, managed to steer the plane away from apartment blocks and commercial buildings before ditching the aircraft in a river. TransAsia Flight GE235 was carrying 58 passengers and five crew members when it lurched nose-up between buildings, clipped an overpass and a taxi with one of its wings and crashed upside down into the Keelung River.